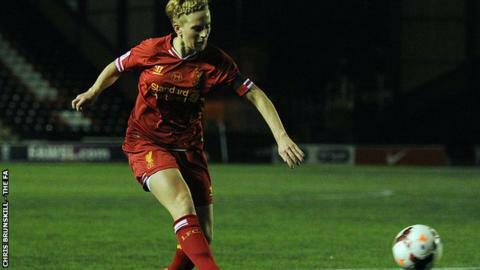 A Natasha Dowie goal gave Super League champions Liverpool a winning start to their title defence against newcomers Manchester City. City, on their WSL debut, were on the back foot for long spells but striker Toni Duggan went close to equalising Dowie's 71st-minute winner. Japanese striker Yuki Ogimi hit two goals in the first half as Chelsea won 2-0 at Bristol Academy. Both games saw good crowds with 1,572 at Liverpool and 1,313 at Bristol. Manchester City, making their Super League debut, were given a tough start as Liverpool pressed for an opener. But after winger Gemma Davison, a close-season signing from Arsenal, had gone close, Dowie shot straight at goalkeeper Andrea Worrall when clean through. City weathered the pressure - and towards half-time, wingers Krystle Johnston and Isobel Christiansen both forced Liverpool keeper Libby Stout into saves. The Reds started the second half as they had the first and Davison shot from 10 yards was cleared off the line by City captain Steph Houghton. England international Dowie then raced on to an excellent pass from central defender Lucy Bronze to slide home the only goal of the game. But before running out deserving winners, the home side had to thank Stout for a tremendous 81st-minute save from Duggan's angled drive. Four days after knocking Bristol Academy out of the FA Cup, Chelsea completed a rapid double over their opponents. Ogimi gave Blues the lead after just 12 minutes, turning in a low cross from striker Eni Aluko. South Korean midfielder Ji So-Yun, who opened the scoring in Sunday's FA Cup win, crossed for Ogimi's second goal on 37 minutes. Academy improved after the interval but it was still the visitors who looked the more likely scorers. Ogimi hit the woodwork and had a header well saved by keeper Mary Earps, who also superbly kept out an Aluko effort.